Mardi Gras marks the end of carnival and is always celebrated 47 days before Easter. After Mardi Gras the fasting period starts so people make most of this opportunity by having fun and partying hard. The celebration involves a lot of colour, decorations, music and what not. This party is for those who are young at heart and want to enjoy every moment. People spend a lot of time to decorate the place and the tables for the party. 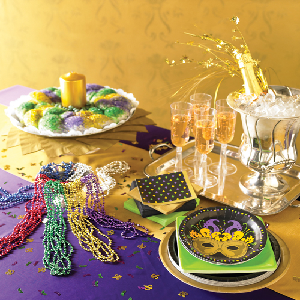 Here are some tips on how to design the next Mardi Gras table. You will be needing table cloth and some decorations. First you need to make a plan: it can be either drawn on a paper or visualize it in your head. Keep the Mardi Gras traditional colours in mind which are: green, gold and purple. The colour green represents frankincense and faith, gold stand for the expensive metal and power; purple is the representation of myrrh and justice. Add these colours in the table design, the necklaces and coins are easily available in these colours. The table design starts with the table cloth. Purchase the table cloth in all the three colours of mardi gras. Place them in a way to create panels of each colour. They should be put in a way that all three colours are visible. On the front of the table, hang a dangle wishing people “happy mardi gras”. This will attract attention and add further colours. To add further detailing, create platforms. Keep boxes of different heights on the table and cover them with different coloured clothes. You could use the same mardi gras colours or other colours which highlight the whole effect. Keep a centerpiece on top of the middle box. It could be flowers, candles, coloured balls, mascot or different cakes. If the table is for a buffet, plan how the dishes will be placed. Do not put all the dishes on one side. Spread them across the whole table. For larger groups, some of the items could be gumbo or jambalaya. If the table is for drinks, spread different bottles across the table so that not any one place seems crowded. Place little decorations in an abstract manner. Throw some beads and doubloons. Keep some baskets for boas and masks. These items will fill the empty spaces on the table. The main target is to make the table as colourful as possible.